The Punkbuster service has been down for an extended period, which has taken hundreds of games offline. I guess our decision to disable Punkbuster for TPU is reaping unexpected benefits. Yesterday I discovered that the WAN link used by TPU was operating at a slower speed than it should have been. The problem seems to have started at the beginning of 2013. I contacted Shaw and they reset the line, which seems to have solved the problem. You may not have noticed any difference, but given the restrictions on outgoing traffic, it's possible TPU was not able to handle larger numbers of players during this period. The TPU stats for 2012 have been archived and a link to the archive added to jdrgaming.com. The current TPU stats have been reset. 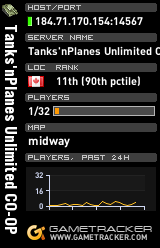 Congratulations to RebelScout for being the highest scoring non-admin player on TPU in 2012! Good luck in 2013. See you on the battlefield. IGN recently sold Gamespy to a company called Glu, and - presumably in the interest of improving their bottom line - Glu has started turning off support for certain games. So far, Glu is targeting older games, such as Neverwinter Nights 1 & 2, Microsoft Flight Simulator X, Swat 4, Sniper Elite, Hidden and Dangerous 2, Wings of War, and Star Wars: Battlefront. For some of these games, it's still possible to host a server, and for players to join that server... as long as you know its IP address. For others, multiplayer has been effectively killed. As you're no doubt aware, Battlefield 1942 uses Gamespy to find servers within the game. And the game is definitely old. How long will it take for Glu to drop support for BF42? Luckily, Battlefield 1942 works just fine without Gamespy server support. Without Gamespy support, players will have to depend on third-party services like XFire and HLSW, as well as known server IP address lists on gamer web sites, to find servers. Some players have already given up on Gamespy because of its flakiness. Maybe it's time for everyone to stop using Gamespy completely. To celebrate the game's 10th anniversary, EA has decided to make Battlefield 1942 available for no charge. The only way to get the free version of the game from EA is to use their awful Origin service. The game is not compatible with the regular version. This means that you can't join servers running the regular version, including TPU. You can run a server with the new version, but only people running the new version can play on that server. Update: servers running the new free version appear in the in-game server browser, and the only way to distinguish them from regular servers is to look at the server info, scrolling all the way to the bottom, until you see the server version. The free version shows as 1.612, while regular servers appear as version 1.61. If you try to join one of the new free servers using a regular client, you get an error message telling you that there's a version mismatch. The original expansion packs (Road to Rome and Secret Weapons) have not yet been made available for free. The new version may not be compatible with BF1942 mods. Update: some work, but many don't. The new version of the server is vulnerable to being remotely crashed by commands, such as game.setTeam and game.createLocalPlayer. Update: Tuia (the person who patched the exploits in the original server) has patched the Origin version of the server. I don't know whether to thank EA or tell them to go screw themselves. It looks like the TPU stats haven't updated since October 20. I'm looking into it. Update: it's because the WAN IP changed. I've asked the hosting provider (ASO) to make the required change. Update #2: Fixed. Stats should be up to date now. Update #3 (2012Nov04): The stats stopped working again on about Oct 27. ASO had to make another change, and stats seem to be working now. You may have noticed that the GameTracker widgets on http://jdrgaming.com stopped working recently. The GameTracker web site currently shows this message: "GameTracker is currently undergoing database maintenance over the next 24-48 hours which may affect server ranks for a portion of servers." Unfortunately, they don't specify when the maintenance started, so I can't be sure when it will end. I will continue to monitor the situation and report any additional information here. Hopefully this issue will resolve itself in the next day or so. In the meantime, TPU is also tracked on Game-Monitor (http://www.game-monitor.com/bf1942_Ga...CO-OP.html). I've been trying to add TPU to TheCLQ since the IP change, but so far with no luck. If anyone knows of any other useful server monitoring sites, please let me know. Update 2012Oct27: Today the GameTracker web site shows this message: "GameTracker has experienced a database failure and has restored the majority of our tracked servers from backup. Please note: If your server was not restored, please re-add it using the add server form. For more information, visit the GameTracker Bug Reports Forum." Since the TPU servers are not showing, I will add them again and hopefully that will resolve the problem. The IP address for TPU's WAN connection changed some time in the last few hours. Automated systems updated DNS records automatically, but issues remain. The Gamespy servers should update gradually over the next few hours, so anyone looking for TPU on the Gamespy server lists might not see it there for a while. Other methods for joining TPU that depend on its IP being fixed (e.g. XFire) will also need to change the IP. This web site, jdrgaming.com, is not affected by the IP change since it is hosted elsewhere. However, the GameTracker widgets used on the site will not work until I'm able to update the TPU server data on the Gametracker site. This may take a few days. Meanwhile, the TPU status widget at the top right of this site is still working fine. You can access that status display directly: tpustatus.jrc-core.com. UPDATE: IP updates completed. Let me know if you have any problems connecting. This morning there was an extended power outage that brought TPU down between about 6am and 7:30am PST. Time to start looking into a UPS, I guess! As of 2012Oct09, the TPU stats are no longer being updated. I am looking into the problem. Update: the company that hosts this site made some security changes, which stopped the stats database from updating. An exception was made for the TPU stats system and it's not working again.